The last four months have been some of the most productive of my life. 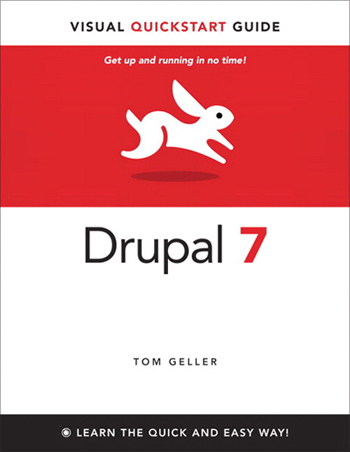 The first task was a top-to-bottom rewrite of the book — which we delayed as long as we could stand, to match Drupal 7’s release version as closely as possible (My original contract with Peachpit Press is dated October 2008, and specified a book about Drupal 6.4! We renegotiated it for Drupal 7 in early 2009.) I also prepared and recorded three more Drupal video courses for lynda.com. The first one (Drupal 7 New Features) came out a few weeks ago; I’ll announce the second one on Drupal release party day this Thursday, and the third should follow soon after. But back to the book: Despite some extra work, I feel 100 percent right about our decision to wait. To be able to announce it on the day of 7’s release is especially satisfying. And I feel good about Drupal 7 itself. I had the pleasure of taking part in a Drupal Marketing Group meeting recently and believe we’ll be reading a lot about Drupal in the mainstream press during the coming weeks. Our banners, parties, graphics and media, public-relations efforts… these all add up to a launch that supports software we can all be proud of. I’m grateful to be a part of it.